Dalia Ofer is the Max and Rita Haber Professor of Holocaust and East European Studies (Emeritus) at the Avraham Harman Institute of Contemporary Jewry and at the Melton Center for Jewish Education at the Hebrew University of Jerusalem. She has been a visiting professor at Harvard, Yale, the University of Maryland, and Stockton College. She is the author and editor of seven books and numerous articles on the daily life in Eastern European ghettos, rescue during the Holocaust, immigration to Palestine and Israel, and the memory of the Holocaust in Israel. She received the Ben Zvi Award for Derech Bayam: Aliyah Bet Bitkufat Hashoah (Yad Ben Zvi 1988) and the Jewish Book Award for Escaping the Holocaust: Illegal Immigration to the Land of Israel (Oxford University Press 1992). 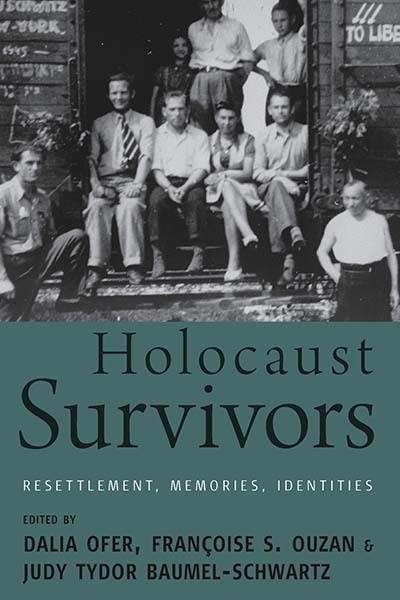 Her edited volume (with Lenore J. Weitzman) Women in the Holocaust (Yale University Press 1998) was a finalist for the Jewish Book Award 2000. Recently, she edited (with Paula Hyman) the online Historical Encyclopedia of Jewish Women (Jewish Women Archives 2007). Françoise S. Ouzan received a PhD in History from the Sorbonne; she was an Associate Professor at the University of Rheims prior to her current positions as Senior Researcher at the Goldstein-Goren Diaspora Research Center of Tel Aviv University, Associate Researcher at the French Research Center in Jerusalem (CRFJ/CNRS), and Lecturer at the International School for Holocaust Studies of Yad Vashem. Her major publications on displaced persons, anti-Semitism, and American Jewry include: Ces Juifs dont l'Amérique ne voulait pas (Complexe 1995); Histoire des Américains juifs (André Versaille 2008); De la mémoire de la Shoah dans le monde juif (edited with Dan Michman, CNRS éditions 2008); and a historical novel, Demain, nous partons (Bibliophane 2007). She participated in the Dictionnaire de la Shoah (Larousse 2009) and in the documentary La vie après la Shoah (The Shoah's Aftermath) by F. Gillery (2009). Judy Tydor Baumel-Schwartz is chair of the Graduate Program in Contemporary Jewry, Director of the Institute for Religious Zionism and Professor of Jewish History at Bar-Ilan University in Ramat Gan, Israel. She is the author of numerous books and articles and specializes in topics pertaining to the Holocaust, gender, memory, the State of Israel, and commemoration. Among her books are Double Jeopardy: Gender and the Holocaust (Vallentine Mitchell 1998) and Perfect Heroes: The World War II Parachutists and the Making of Collective Israeli Memory (Wisconsin University Press 2010).